I have systats and I can load world clock but MY problem is that the "?" icon that systats defautls too upon loading stays in the background even when I load world clock...what am I doing wrong? should the "?" icon go away when I load the world.ini? If you set the location to anywhere in India the time is 30 minutes out. I know its bizarre but india is 5.5 hours infront of UTC but this mod shows it as only 5 hours. UPDATE - its not the docklet, the URL used for getting the time returns totally the wrong time for India!! Doh! Does anyone know of any other sites that could be used for the time feeds? hiya, thanks for the great clock. i finally managed to make this fantastic thing work! although there's something id like to ask... well, my pc's time(Windows' clock) is set for tokyo(japan) and the world clock is set for glasgow,uk. Right now the time on my pc's saying 4:12(which is the time for japan) and the world clock's saying 21:12(which is set for glasgow). The thing is, it's june now and it's supposed to be summertime in britain. so the time differences should be 8 hours but no matter whatever i do, seems like i cannot apply summertime to this world clock. i restarted pc and checked again but still there's 9 hours difference. It should be 20:12, if you know what i mean. 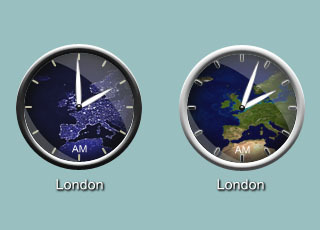 I want to see the right time on the world clock.... I really love this clock! It'll really help me to contact my boyfriend and pals so much while I stay in Japan for summer holiday. This is a pretty cool clock. Some suggestions, if you're even working on it anymore, would be to make the hour hand a little shorter and maybe a different color to make it more recognizable. Both hands are the same color and almost the same length so it can be hard to immediately tell the time. Also, this has been brought up before--most of us know where we live. We don't need the name of our city to show up when we mouseover the clock. Better to have the date on there. Anyways, thanks for the clock! This is a great looking clock. I even figured out how to get it installed and to work without any issues. Images show up and all that. The only problem I'm having is trying to get it to set to London, UK time. It'll set to my own, local time. Even Paris.. but not London, which is the only location I want. Hmm.. Nevermind. To get it to change to London don't put in london,uk.. Just London. Go figure. Thanks for this. It's perfect, now that I've figured it out. I am getting a black clock... time is correctly set to my location (Mexico City, Mexico) but no map at all Any ideas? @fedroponce: Change the world.vbs file with a new script, posted by BirdWatcher on this page. Use notepad. This sure is a wonderful docklet. I have installed it, but am faced with a weird problem, and am guessing its a bug with the docklet. All my clocks are about Half hour ahead of the usual time. The clocks I have configured are as follows: Bangalore, India: weather.com URL - WWW Link Cambridge, United Kingdom: Weather.com URL - WWW Link The urls above do give out the correct time. However, the clocks end up being half hour ahead. Any suggestions to tackle these? Let me know. I've tried to install this a couple of times without success. I assume some .dlls or something are winding up in the wrong place. I've unzipped it into the docklets folder as well as (at different times) the sysstats folder with roughly the same result; namely, I see the location (Groton) but nothing else. In fact, the sysstats question mark no longer appears period. Instead the word "null" is displayed in miniscule letters whenever I select "Add New Sysstats Docklet". I guess it's clear I'm new to this. I'd appreciate anybody walking me through it real slow. Hopefully I'll get the hang of it soon enough. I've successfully installed a few Sysstats doclets but can't get this one to work. Sure like the concept. Sysstats 2.5.11.